Let it snow, let it snow, Let it snow !!! Well we don’t have a choice in the matter, now the snow has returned. In bad weather my husband always uses the train to get to work…. Tonight I made some hot cocoa covered it with whipped cream and marshmallows then watched the snow from inside where it is nice and warm. Today I didn’t brave running in the snow now its turned to ice (its like a ice rink outside now). Took forever trying to walk to school in it so I decided to go to the gym and use the treadmill. I am not usually a treadmill fan as I usually get so bored out my head with it, today I had no choice and I surprised myself how much I liked it. So much so I ran 6 miles on it!! "The Ben & Jerry’s Capture Euphoria Challenge: Day Three : Runstreak Day 16…"
"The Ben & Jerry’s Capture Euphoria Challenge + Welcome To The Weekend Blog Hop …"
Man, I need your motivation!! 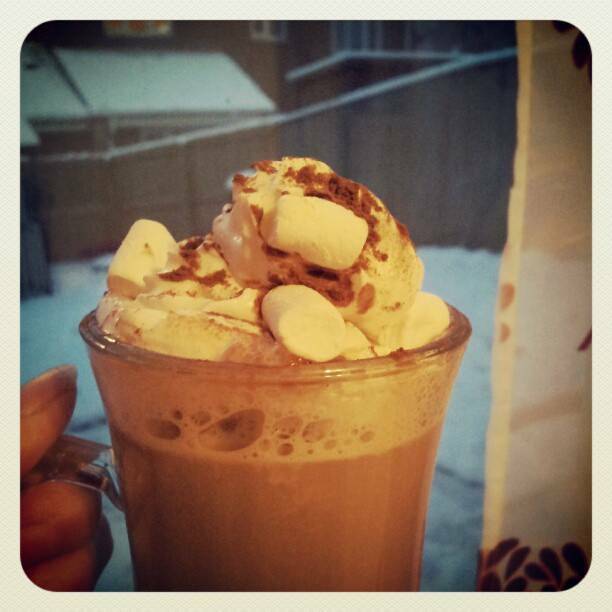 I also need one of those hot cocoas-seriously, I've never made one that looked that good! Oh, that looks so-o-o good! I am a big fan of cocoa! Congratulations on getting some running done on the treadmill since you could not run outside. Oh drool that pic looks delicious! Ps… Hi five on 6 miles!!! !